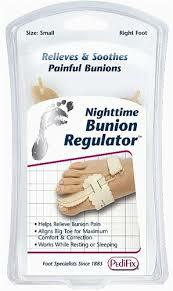 Separate Nighttime Bunion Regulator's™ hook-and-loop band from itself and remove the free end. (Leave sewn loop on bottom splint arm, which goes under foot.) Insert big toe between leather-covered cushion and other cushion at the concave part of splint. Be sure leather-covered cushion covers bunion joint. Lead hook-and-loop band around outside of foot and through slot on top splint arm. Adjust tension by pulling band so big toe moves slightly. Fold hook-and-loop band onto itself. Press together to secure. Limit initial usage periods to 30 minutes each. Gradually wear splint for longer durations and increase band tension as comfort level improves. Results will vary based on the severity and nature of the condition. Wearing the splint regularly can reduce discomfort and pain while possibly slowing the progression of bunion deformity. Note: This splint is designed for use while resting or sleeping only. Do not use while standing or walking. If desired, a sock may be worn over the splint while sleeping to reduce interference with bedding. Do not wear this splint with shoes. Hand wash in warm water and mild soap. Rinse thoroughly. Press flat in a clean towel to remove excess moisture then air dry completely, away from direct heat and sunlight, before reuse. If you have diabetes or poor circulation, consult your physician before using this product. Non-sterile. Do not use this item on broken skin. If this product causes skin discoloration, numbness, irritation or pain, discontinue use immediately.